A Certified Public Accountant by profession, Dato’ Sandra Wong has extensive experience in investment banking, finance and strategic planning for investments projects, as well as acquisition of strategic businesses. She was Head of Corporate Finance at Permata Chartered Merchant Bank and went on to head Corporate Finance at Chase Manhattan Bank. From 1991 to 1996, she was Director of Finance and Strategy for the Renong Group of Companies. 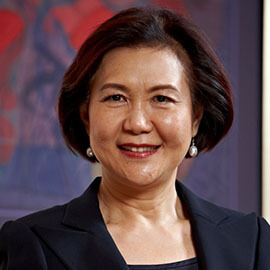 She became the Chief Executive of Jaya Tiasa Holdings Berhad from 1997 to 2000 and still holds a directorship position till to-date. She was also a Director of Sin Chew Media Corporation Bhd from 2004 to early 2008. She is currently the Executive Director of Mediharta Sdn Bhd, a company providing security packaging to the pharmaceutical industry. Dato’ Sandra was appointed to the Board of the Kuala Lumpur Business Club on 28th October 2008.